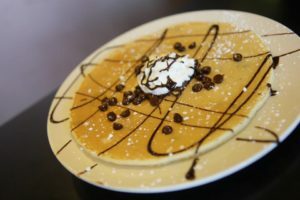 Indulge in the most delicious pancakes you have ever tasted! Filled with fresh blueberries and topped with blueberry compote. These pancakes will thrill you! Filled with fresh bananas and served with our bananas foster sauce. 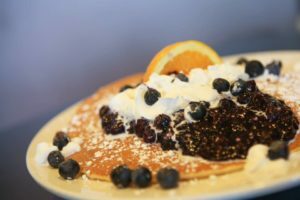 Whole grain pancakes filled and topped with strawberries or blueberries for our health-conscious pancake lovers. Filled with strawberries and topped with strawberry compote. You will remember these cakes forever! Try a stack of six of our sand dollar sized pancakes. Our favorite combination of strawberries, bananas & chocolate chips cooked into our classic pancakes. Topped with our chocolate syrup, you will be addicted to these chocolate chip pancakes! Our classic pancakes infused with bacon. Every heart beats true for these cakes filled with strawberries and blueberries, and topped with whipped cream. 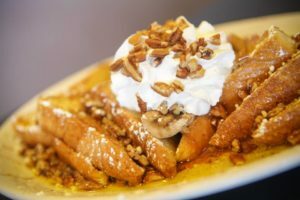 Your choice of pancakes, belgian waffle or french toast served with our warm bananas foster sauce, whipped cream, pecans and fresh banana slices. Grilled and flecked with powdered sugar. Two belgian waffles made fresh and flecked with powdered sugar. Fresh avocado, fresh mushrooms and choice of cheese. Grilled ham with your choice of cheese. Hot sausage, jalapenos, green & red peppers, onions, mushrooms and your choice of cheese. Fresh spinach, green & red peppers, onions, mushrooms, tomatoes and your choice of cheese. Fresh spinach, fresh mushrooms and your choice of cheese. Grilled Shrimp, Onions, Green & Red Peppers and your choice of cheese. Steak with your choice of cheese. Ham, green & red peppers and cheddar cheese. Your choice of cheddar, swiss, feta or pepperjack. Loaded with chorizo, eggs, home fries, diced fresh jalapenos, choice of cheese and a side of our house made pico de gallo. Avocado spread on marbled rye with two eggs, a side of our house-made pico de gallo and a fruit cup. 2 eggs served with bacon or sausage and hashbrowns or grits. Served with toast or sand dollar pancakes. 2 eggs, sausage, ham, bacon, pancake, grits, hashbrowns and toast or biscuit. No substitutions. 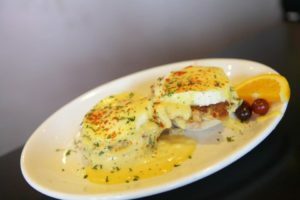 Served with 2 eggs and your choice of toast or sand dollar pancakes. Served with toast or sand dollar pancakes. 3 made to order crepes, flecked with powdered sugar & topped with whipped cream. Choose Nutella, Strawberry Compote, Blueberry Compote or Apple Compote.